It wouldn’t be the off-season without a few minor league baseball teams changing logos, adding mascots, or re-branding themselves in some way. The former Akron Aeros have shed the moniker they bore for 17 seasons to become the Akron Rubber Ducks in 2014. “We wanted to do something that was fun and entertaining while honoring the heritage of this great community, ” team owner owner Ken Babby said. I don’t like the new logo – it makes me think “auto racing.” The old Aeros logo at least did more to suggest it belonged to a baseball team. The Altoona Curve announced details of next summer’s two-day 2014 Eastern League All-Star Stop event, which will take place on July 15 & 16, 2014. The Toronto Blue Jays extended their affiliation agreement with the New Hampshire Fisher Cats through 2016. The two teams have been partners since the 2003 season. This week, the Trenton Thunder were recognized as Minor League Baseball’s Team of the Year through fan voting conducted on MiLB.com. They also won an award for Promo of the Year (for the retirement party for Chase, the team’s bat dog) and the Mascot Clip of the Year. 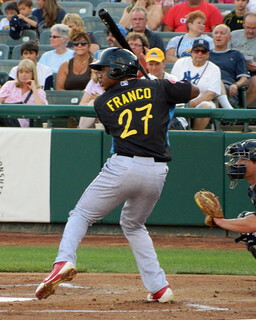 Reading Fightin Phils infielder Maikel Franco was the MiLB.com staff pick as the Breakout Prospect of the Year, and Harrisburg Senators pitcher Richie Mirowski was the fans’ choice for Best Reliever of the Year. “We wanted to do something fun and entertaining…” And a rubber duck is a kid’s bathtub toy. So, why is the logo a really nasty-looking duck burning rubber (yes, I get the rubber part)? Ducks are cute. This one isn’t. I don’t know how well Akron draws fans. This could be another scam to sell more merchandise AKA Reading Fightin Phils. Now the league has a rubber duck to go with the ostrich. We’ve got porcupines running amok on railroad tracks in SWB. They had to do what they had to do to win back fans- attendance wise it appears they’ve succeeded. The real question will be if the people will still come now that they’ve see the new ballpark. My experience was much better in 2013 under the current regime. Good riddance to the stooge Kristen Rose. I wouldn’t hire her to run a Burger King. I don’t really have a preference between the two; I don’t have a huge problem with “Aeros” but I’m not sure if that has anything more or less to do with Akron than “Rubber Ducks”. …And in response to Freddy: It’s absolutely about the merchandising, but I’m not sure I’d call it a scam… “Scam” implies there’s fraud or something dishonest going on, and I don’t see that. Is it an attempt to grab headlines during the offseason? Of course. Is it an attempt to sell more merchandise? Abso-freakin’-lutely. It’s a business, increasing revenue is what they’re aiming for. Although I haven’t been to an R-Phils game in years, they were my first minor league team, I still think warmly of them, and I don’t blame them for changing to “Fightin’ Phils”, as it sort of keeps the name while making it their own and throwing back to the Phillies teams of the 1950’s. That being said, even though I have bought R-Phils shirts and hats before and though I like the Crazy Hot Dog Vendor, I’m not buying any ostrich-themed merchandise from Reading… and I really really don’t like the “Baseballtown” road unis. This is all just standard operating procedure for Minor league teams these days. I don’t always like it, but it’s just the way everybody’s going. Reading took it a little further than most, with their multiple uniform sets and schizophrenic “Baseballtown” road identity. I’m not a fan of what they did. I don’t have an issue with Akron changing their identity, either – I just don’t like the “Rubber Ducks” name or the tire tread logo. I have the Baseballtown all star blue jersey from the year they hosted the 2012 all star game- I bought it on a discount in 2013. I am also a proud non owner of anything with an ostrich on it.